... this time up some Fire Dragons and their Exarch. The one upside of my current immigration limbo while waiting on the paperwork to be done, is extra painting time. 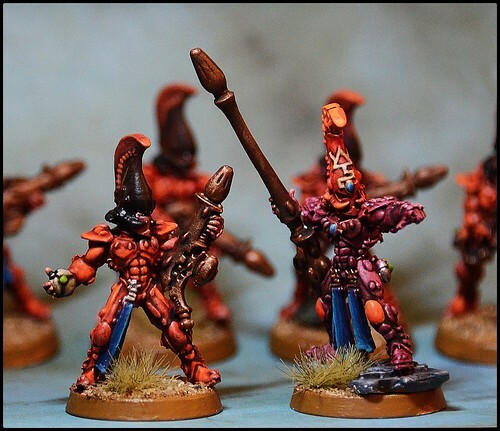 I have really enjoyed working on this Eldar army for a friend. The more consistent practice is paying good dividends when it comes to technique and getting to try and improve my abilities with the brush. 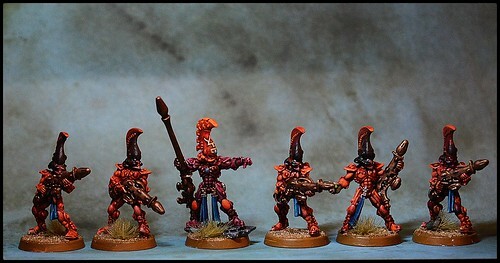 These guys were some experiments with inks and glazes, as the Fire Dragon's are usually seen to these bright orange uniforms. I was quite pleased the final results, and next up is a cool piece that Graeme has converted to lead his army, so it's a centerpiece and a really cool miniature, so hoping I can do a good job on it and make sure it's a fitting leader for the Eldar host!